Is running Anonymous hurting you? If you’re a publisher and if you’re using Google Ad Exchange, you will be familiar with Google Ad Exchange pricing rules, where they allow you to set minimum price for your inventory below which Advertisers are not allowed to bid. But there is more to it. Let’s dive into some details. Branded: Buyers see complete URL of publisher’s page where their ad is going to be displayed. Usually branded is priced higher than other two branding types which are mentioned below. Semi-Transparent: Here, buyers will only see the top level domain of the publisher’s website. Or Publishers can also specify custom URL that needs to be sent to Buyers. Usually this will be priced lower than Branded. Also, this will only be available for Desktop and Mobile web inventories. Mobile App inventory always transacts as Branded. Anonymous: Buyers will be having no information where their ad is going to be displayed. Usually Anonymous will be priced lowest of the three. At any point in time publishers can only set 2 Branding types. It’s either Branded and Anonymous or Semi-Transparent and Anonymous. But there’s a catch here. Only Google AdWords can bid through Anonymous and all other buyers can only bid through Branded. So using Anonymous gives little control for both Publishers and Advertisers and most of the times, the revenue Publishers get from Anonymous is minuscule compared to Branded, even though it consumes a lot of impressions. We ran an experiment where we tested different combination of Anonymous and Branded in parallel through Tercept A/B Testing setup and the results surprised us. We had set 3 different pricing rules with the combination of Anonymous and Branded mentioned below. 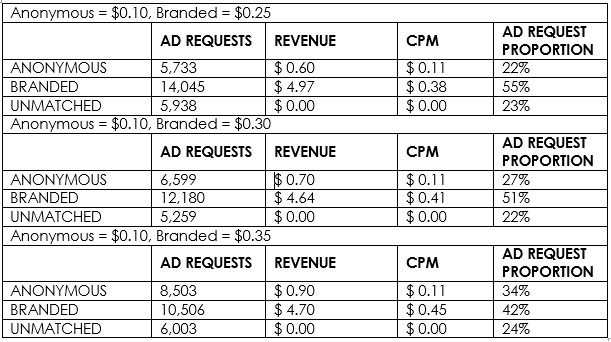 So if you see the above data, Adx was actually balancing things out and giving the same revenue / Ad Request CPM irrespective of the floors we kept. So when we increased the Branded floor, more bids failed to win and it was easily available for Anonymous (read AdWords) for the price way below the Branded floor. Basically, Google AdWords was getting a second chance here. So publishers should know whether to keep Anonymous and Branded at the same price, keep Anonymous very close to Branded price or maybe not run Anonymous at all. I will share more on this in my upcoming blogs here. Stay tuned.